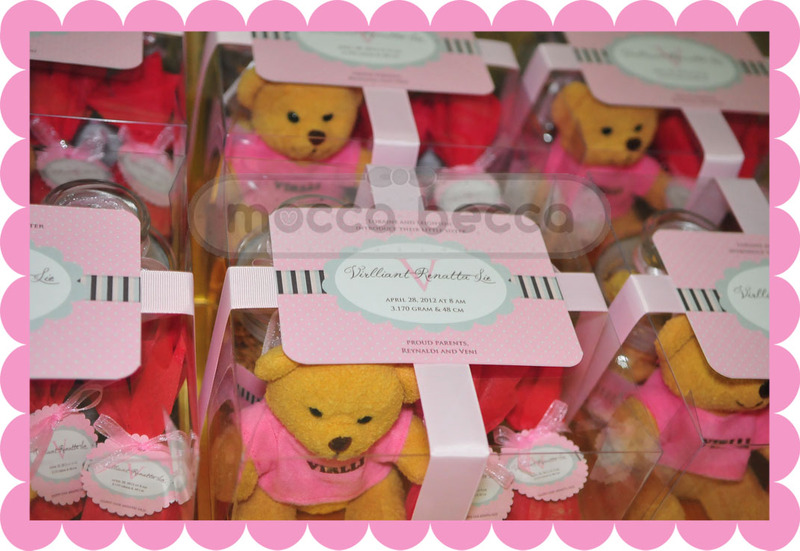 Ordered by Veni, theme color pink-grey. 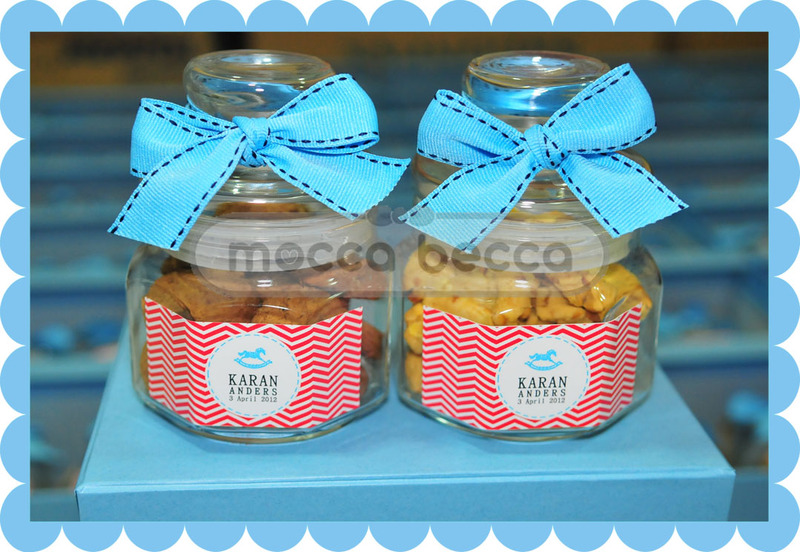 1 jar peanut cookies + 1 jar choco cookies. 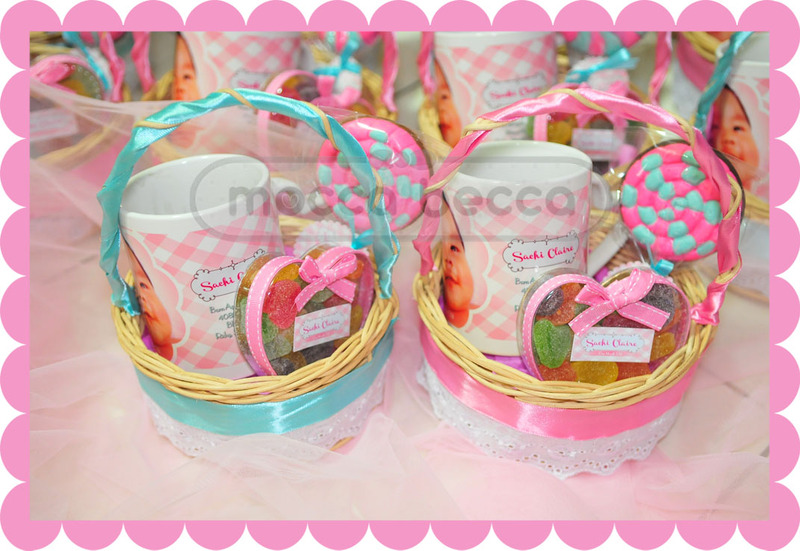 one month hampers for baby Virlli. 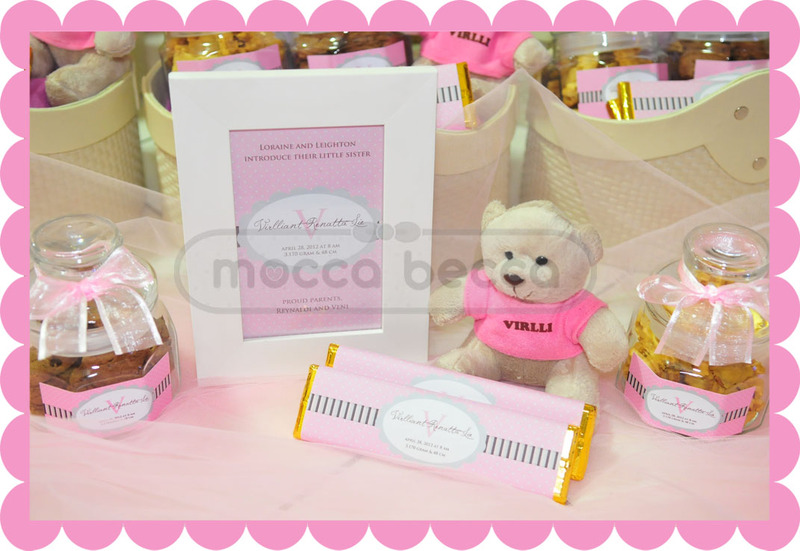 additional for baby Virlli: 1 mika box + 1 jar peanut cookies + 1 jar choco cookies + 1 bear with shirt and name + 2 eggs. 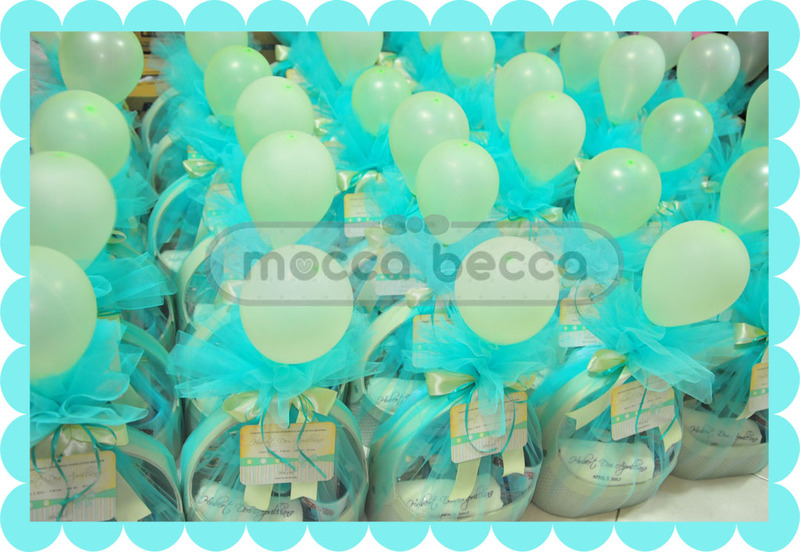 Happy one month Virlli !! 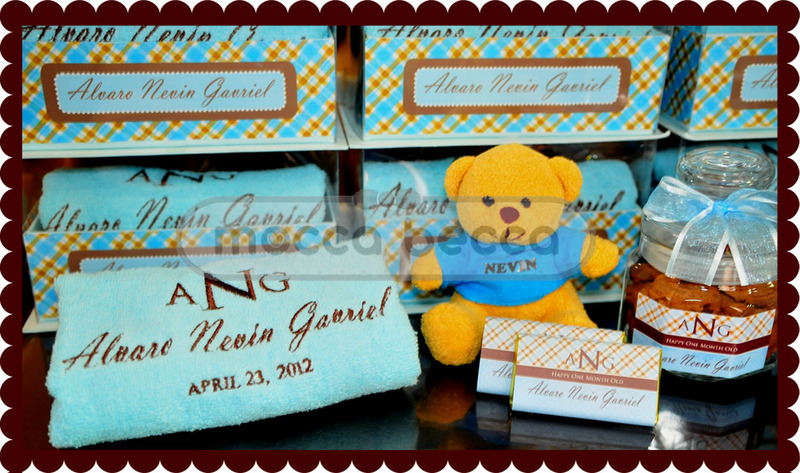 Nevin -ANG- one month hampers. 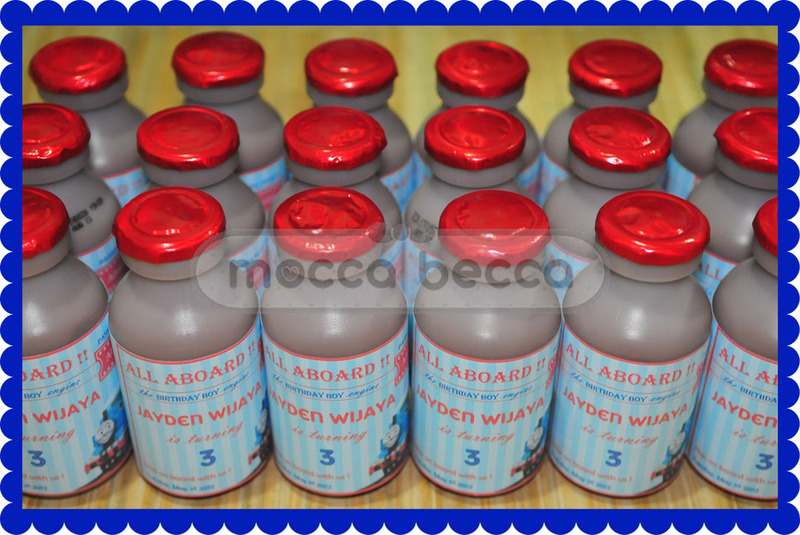 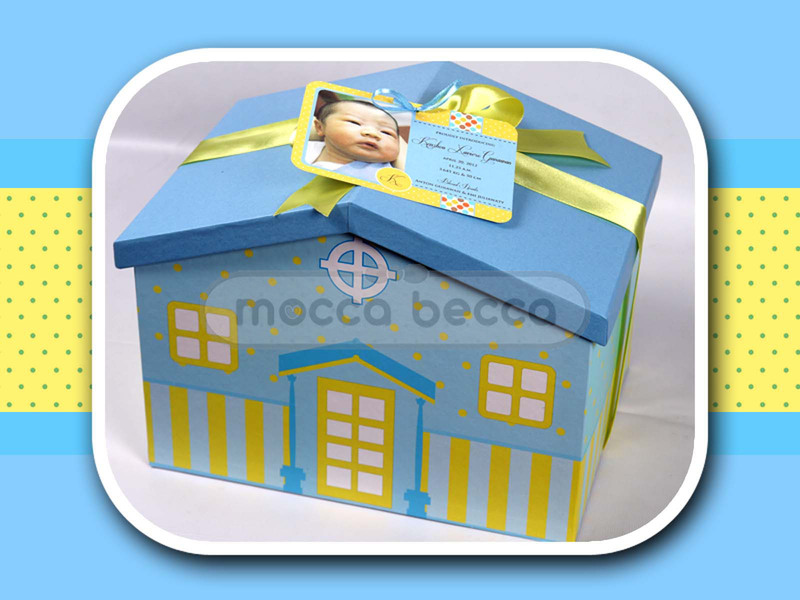 Ordered by Maria, theme color: blue-brown. 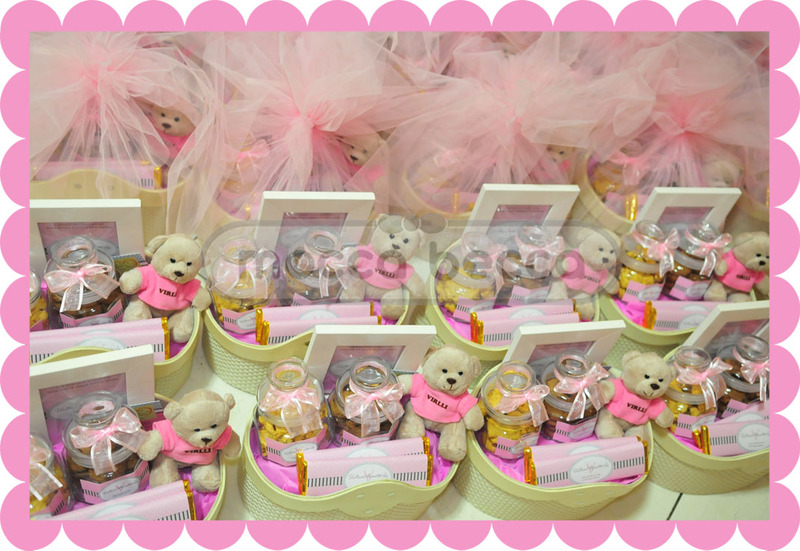 include: 1 custom mika box + 1 bear with shirt & name + 1 towel embroidery + 1 jar choco cookies + 2 mini choc bar. 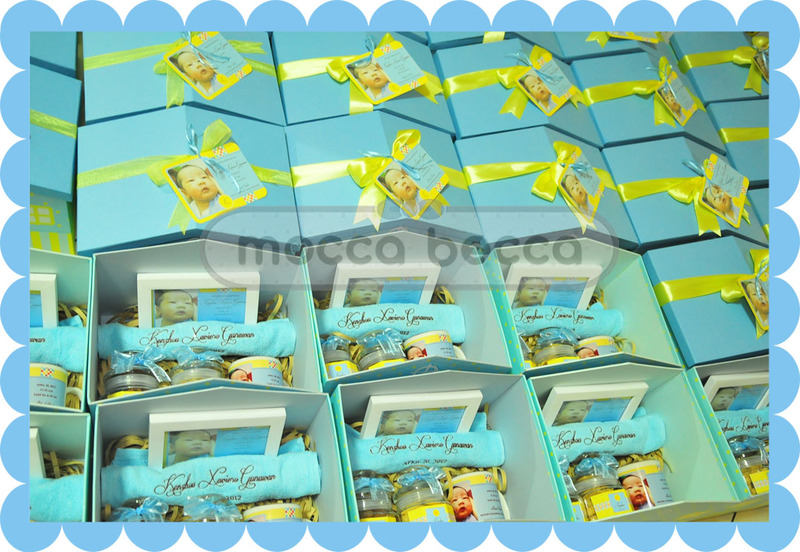 40 box one month hampers for baby Nevin. 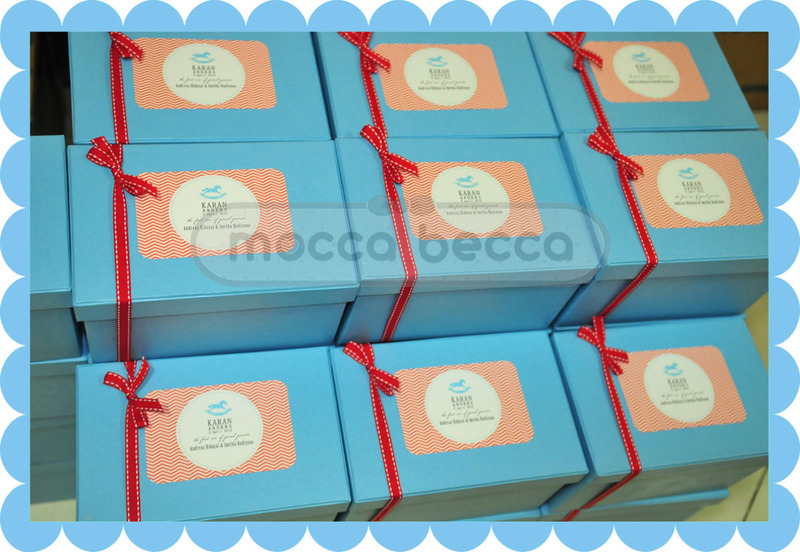 ready to deliver … happy one mos Nevin !! 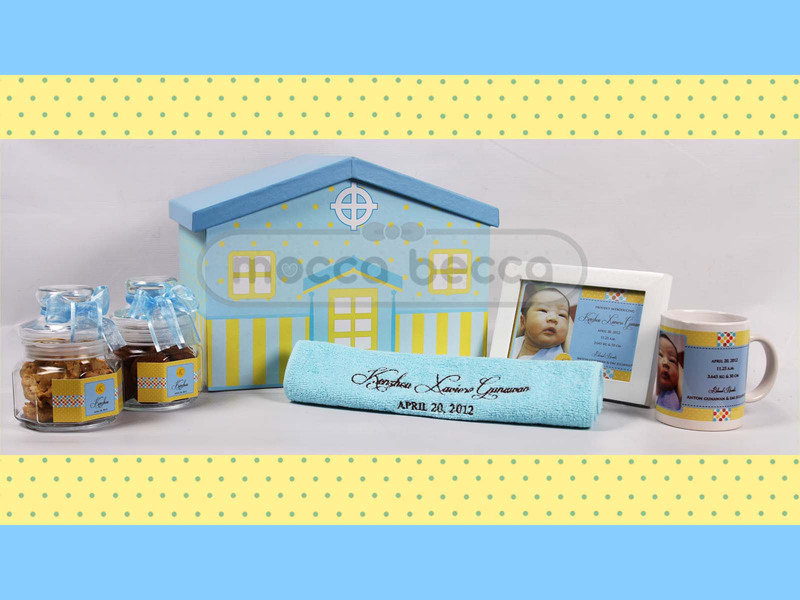 Ordered by mommy Emi, theme color blue-yellow. 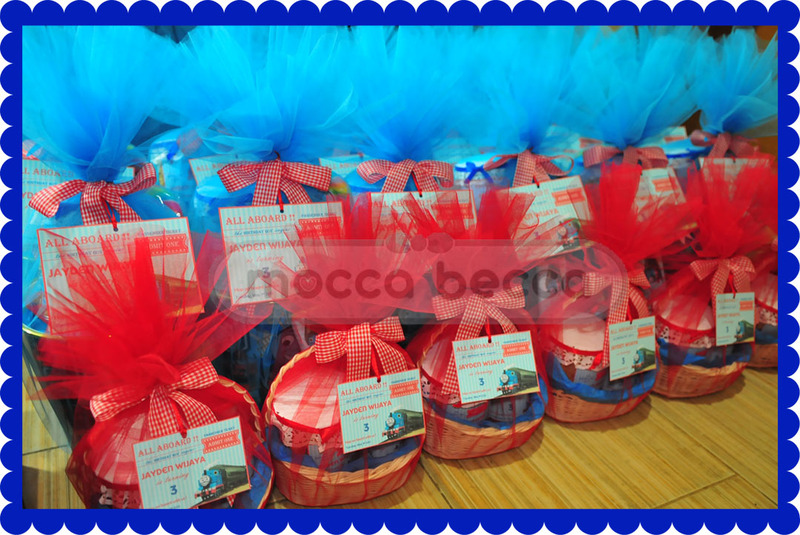 include: 1 exclusive house box + 1 jar peanut cookies + 1 jar choco cookies + 1 wooden frame 4R + 1 mug printed + 1 towel embroidery. 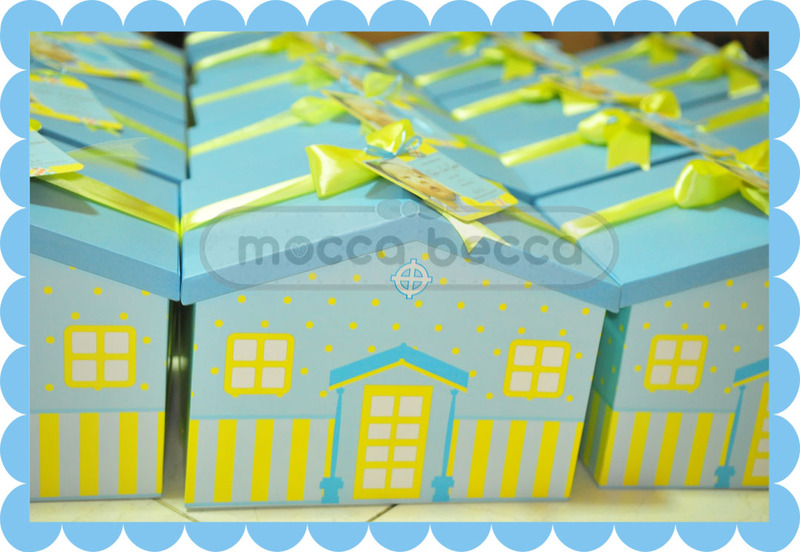 50pax house box hampers for baby Kenzhou. 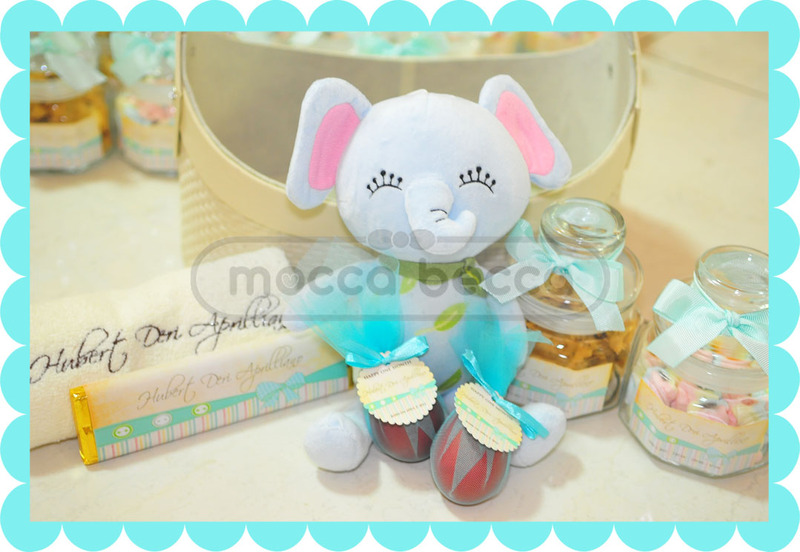 Design Sachi Claire made by Sachi’s parents (Ricky and Shindy). 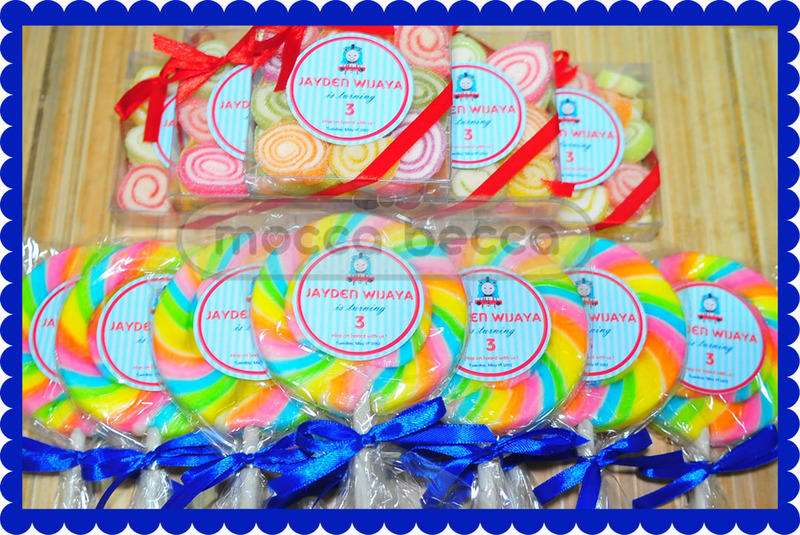 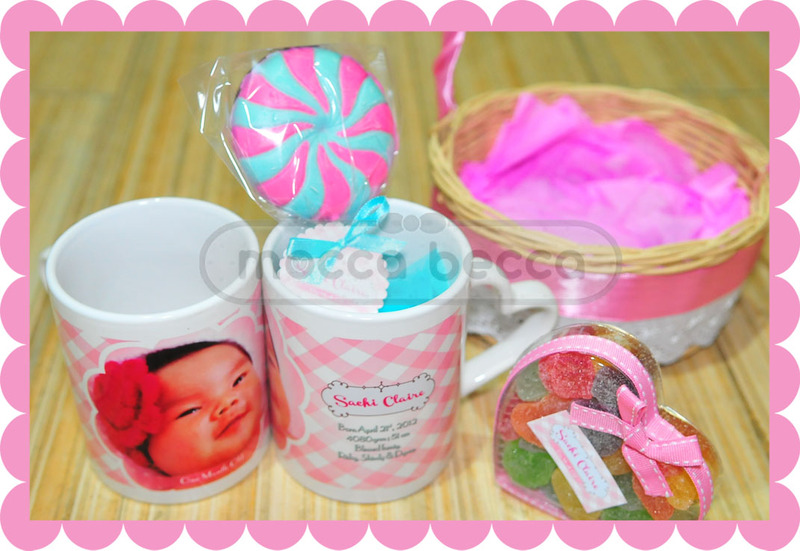 include: 1 mini rattan basket + 1 printed mug + 1 chocolate lollipop + 1 pack jelly candy. 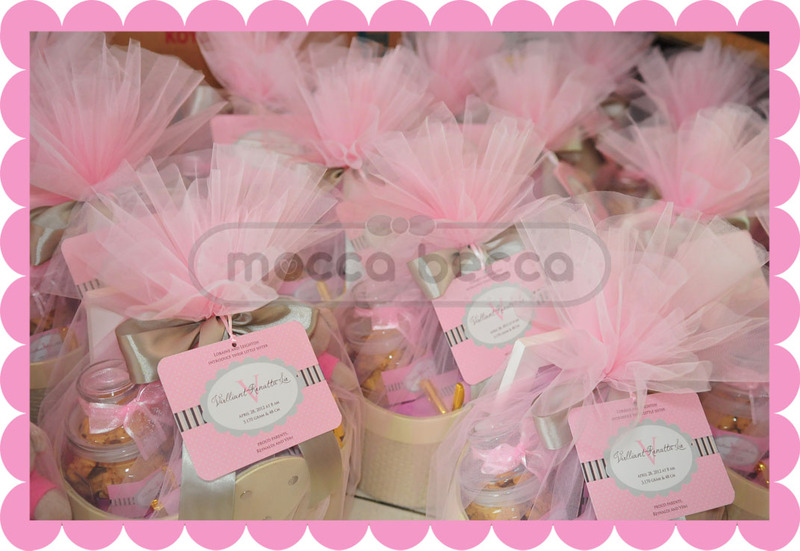 55 pax ordered by mommy Shindy. 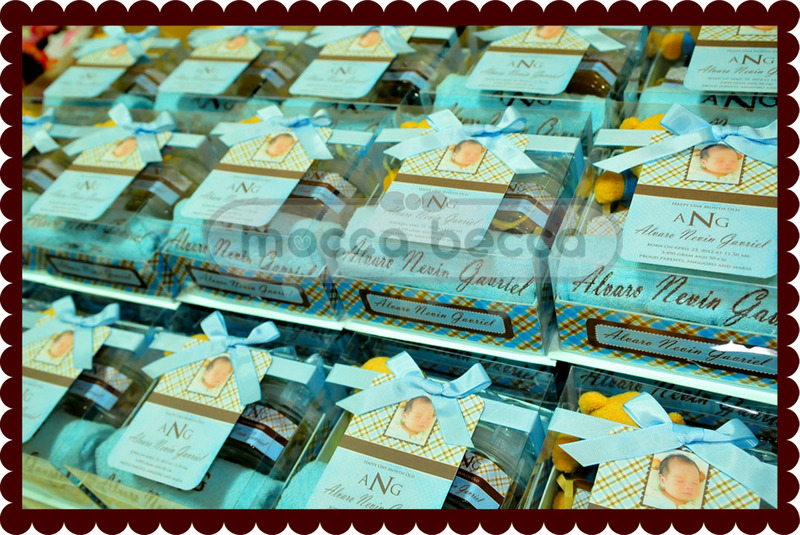 Welcome Asia La Foi !! 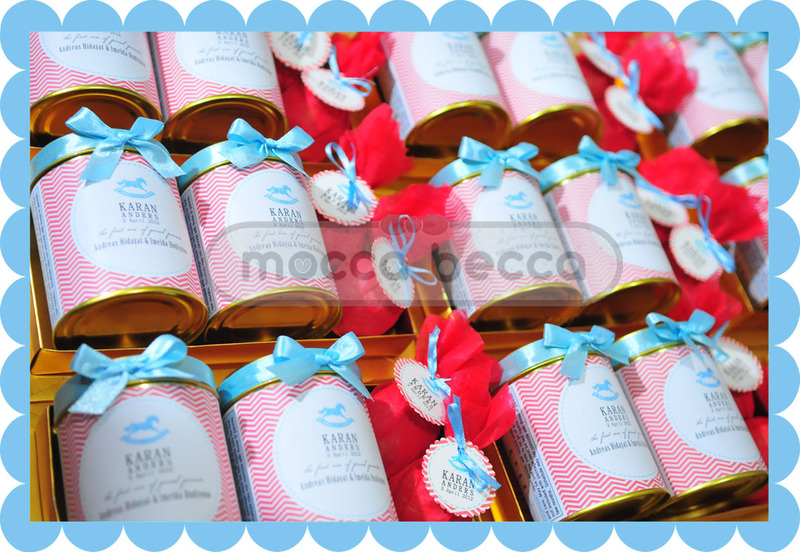 the items for baby Asia’s hampers. 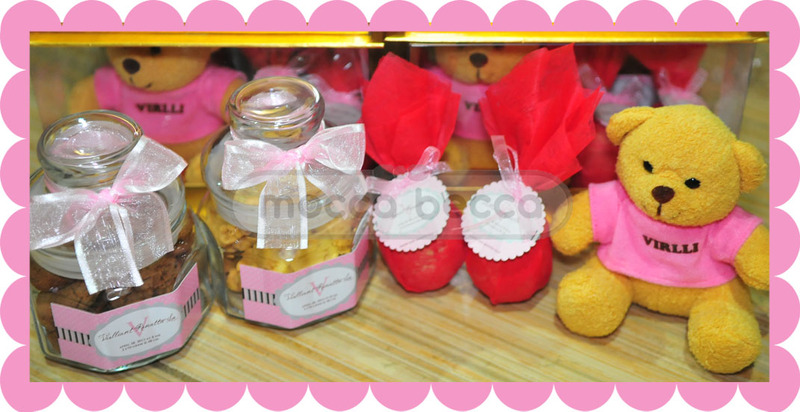 1 rattan basket + 1 bear with shirt and name + 1 towel embroider (exclusive) + 1 frame 4R + 1 jar peanut cookies. 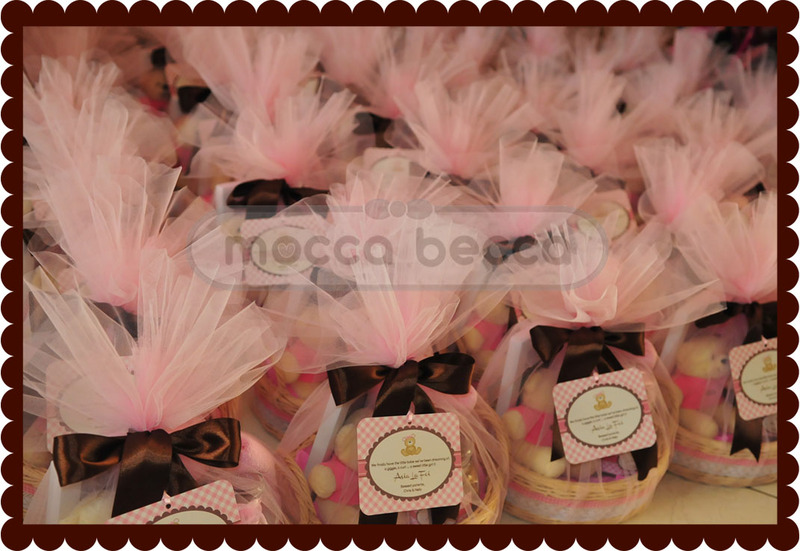 80 pax hampers for baby Asia. 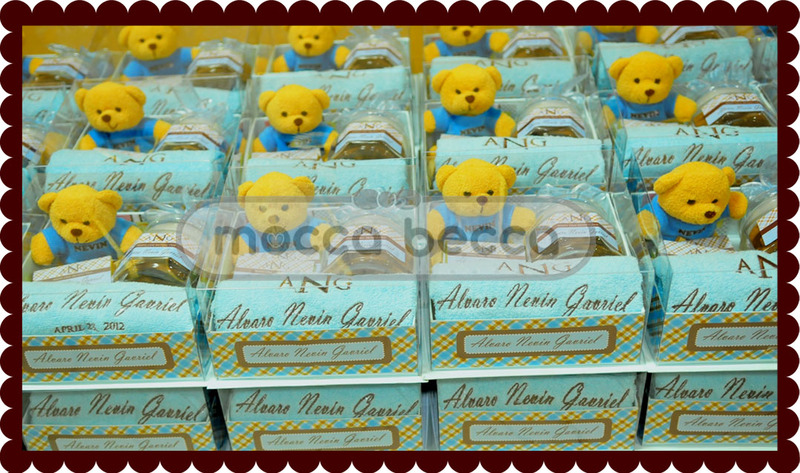 Ordered by Imel for her son, Karan Anders. 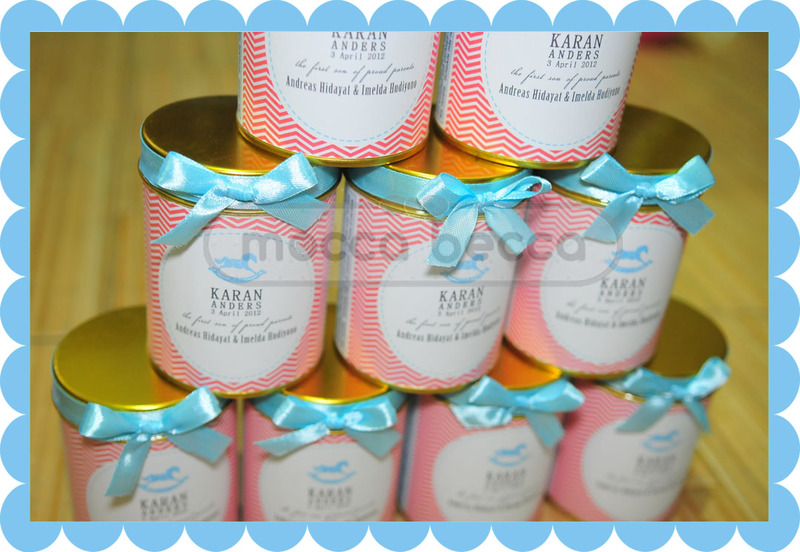 And special thanks to Marysia W. for designing the card and sticker jar. 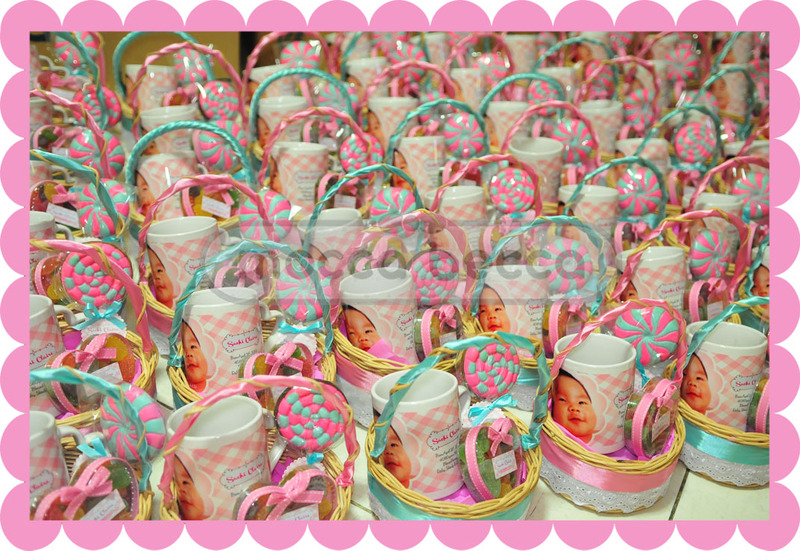 50 pax baby Karan’s hampers. 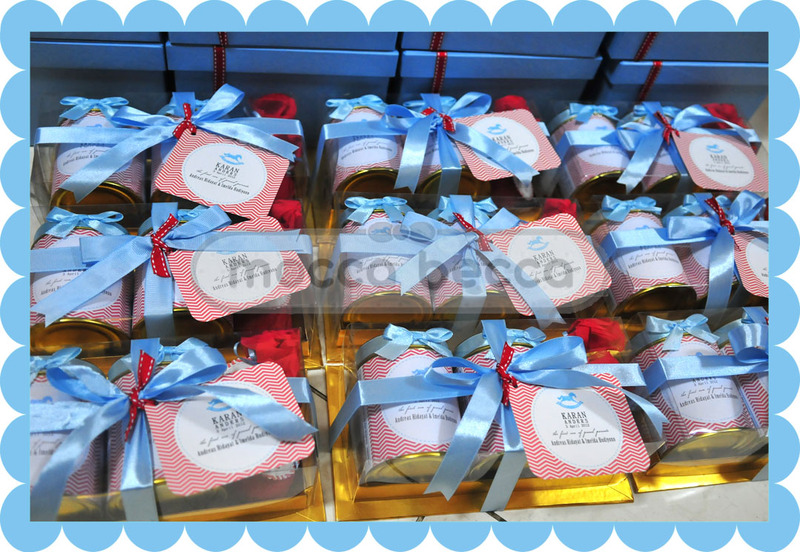 1 mika box + 1 peanut cookies in tin can + 1 choc cookies in tin can + 2 eggs. 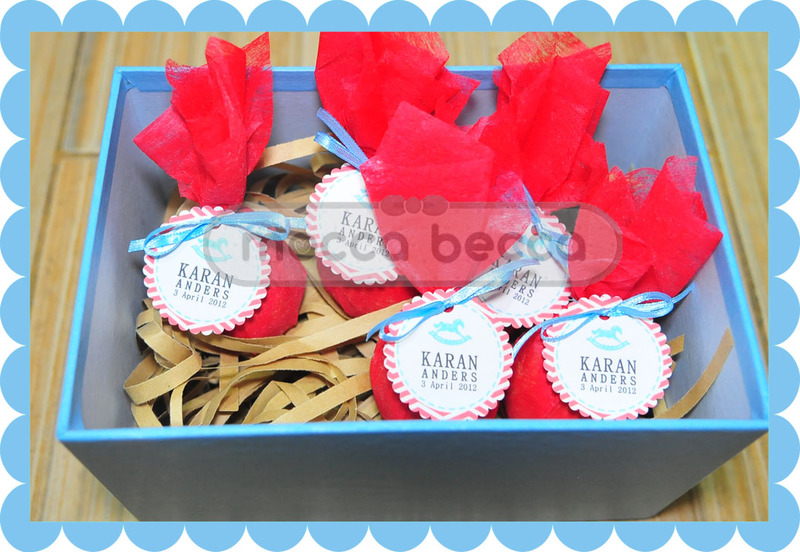 Happy one month old KARAN !!! 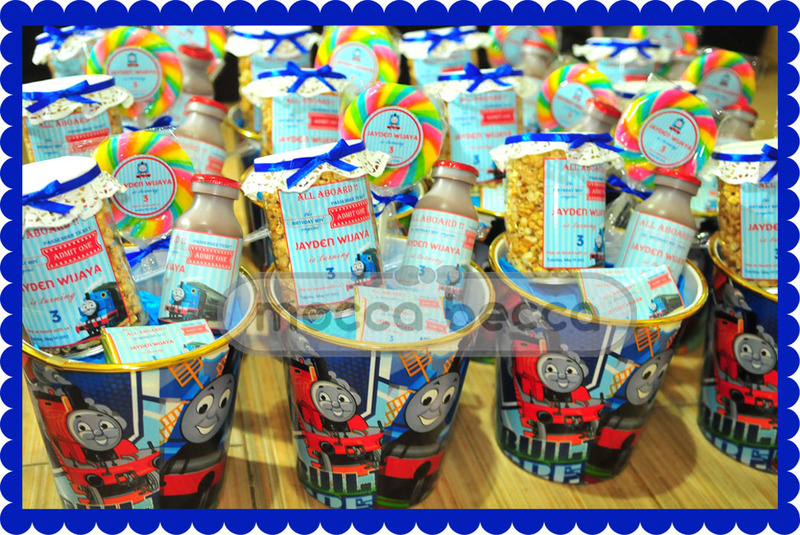 Theme for Jayden’s 3rd birthday is Thomas and friend. 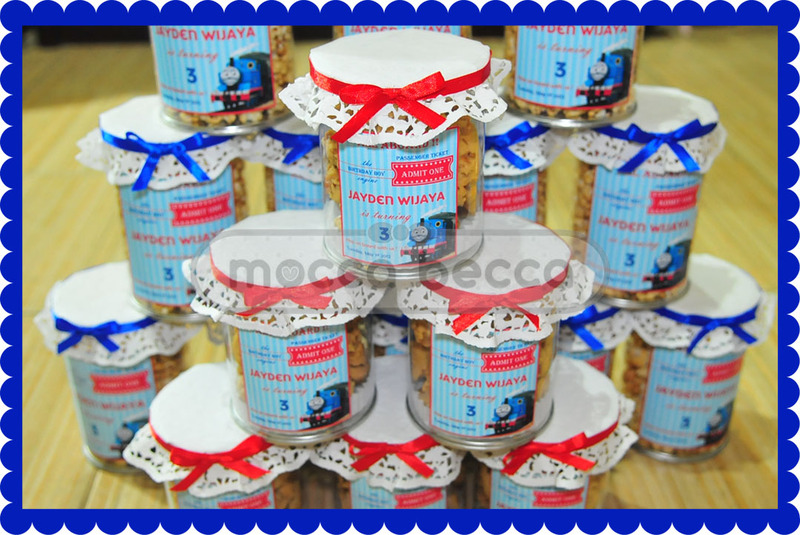 Caramel popcorn and peanut cookies. 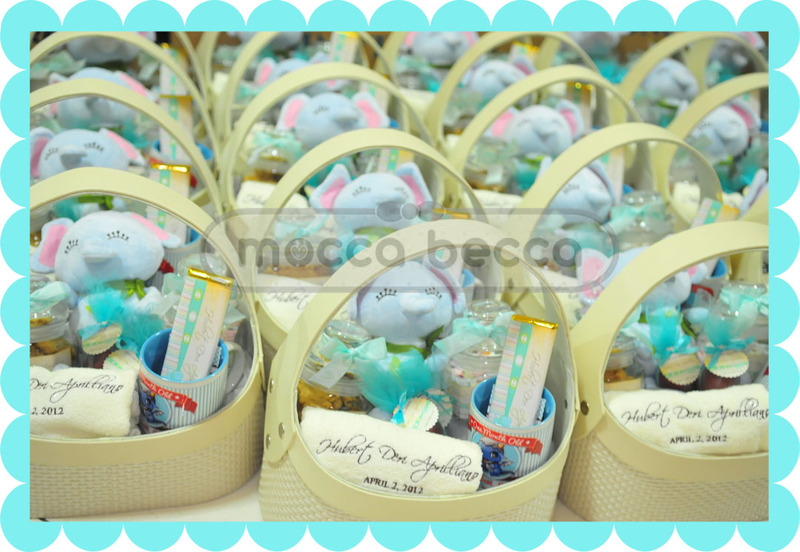 Customized baby one month hampers for Hubert (tambahan pribadi dari mommy Hubert: mug+balon). 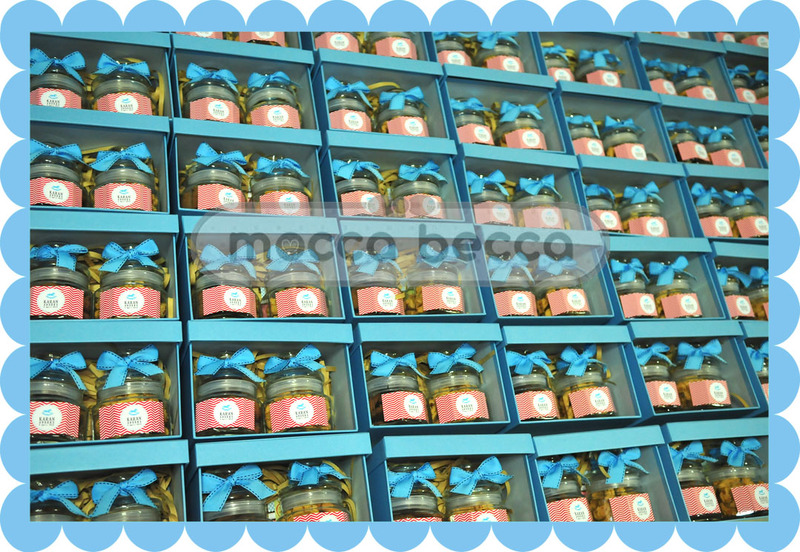 1 jar peanut cookies + 1 jar fruity marshmallow + 2 red eggs.